Experts predict that business will be key to the success of climate change action post-COP21 Summit in Paris next month, according to the findings from a new study exploring leadership on climate change. Whilst a significant majority (92%) of experts are confident that the UN conference on Climate Change will result in a global agreement, only 32% believe that it will have binding powers. Confidence in the ability of governments to agree on a framework in Paris that would reduce emissions in line with the 2C target is virtually non-existent (4%) and the removal of subsidies for fossil fuels (82%) was rated the most effective economic instrument to contain global warming by experts. Scientific institutions and civil society are seen making the largest contribution to advancing climate change with more than half of all respondents viewing their record positively. The future contribution of national governments and business will be key to the implementation of the post-Paris framework. Eighty six percent (86%) of experts predict that the private sector will play an “important” or “very important” role, and 90% of respondents believe the same to be true for national governments. However, gaps between recent performance and future expectation mean that both institutions will have to step up their efforts. 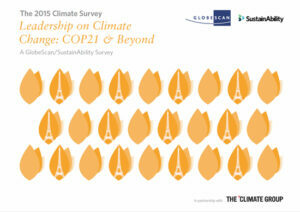 The GlobeScan/SustainAbility Survey is one the longest-running expert surveys on sustainability-related topics of its kind. For the 2015 Climate Survey, expert stakeholders representing business, governments, NGOs, and academia shared their expectations for the COP21 meeting in Paris and provided insights about the role of various actors and climate change strategies post-2015. Opinions of expert stakeholders from 69 countries show that there has been a big turnover in perceived corporate leaders on climate change since Copenhagen in 2009, citing a whole new set of champions including Unilever, Tesla, IKEA, Google, General Electric and Walmart. Over 600 experts were asked which companies are leaders in climate change and amongst international companies, Unilever is seen as having made the largest contribution to advancing solutions to climate change in the last five years. The corporate landscape has significantly shifted since 2009 when General Electric was seen as the leader and two oil and gas companies – BP and Shell – were included in the list. Investments in renewable energy and technological innovation were the most frequently cited reasons for perceived climate change leadership in individual companies reflecting a strong belief that by undertaking such initiatives companies are addressing the issue in a real and substantive way. Economic instruments continue to be seen as the most effective approach in providing solutions to climate change on the global scale. More than 80% of experts say that the removal of subsidies for the fossil fuel industry is the most effective of available economic instruments. Views on the most effective climate strategies differ across geographies. European experts (35%) see regulatory approaches as the most effective strategy to address climate change at the macro level, while North American respondents (38%) give preference to economic instruments. Behavioral approaches such as public education are twice as popular in the emerging nations (21%) as in the industrialized world. Hey Buddy!, I found this information for you: "Business Will Be Key to Implementation COP21 Post-2015". Here is the website link: https://www.duurzaam-ondernemen.nl/business-will-be-key-to-implementation-cop21-post-2015/. Thank you.